Officials said the expansion projects aims to reinforce ACC’s image as the “icon of style” in Cebu. It also hopes to take advantage of the upper market’s spending power, catering to the ABC+ and the tourist market. The four-level retail expansion completes the retail master plan of ACC, with an additional 36,500 square meters of gross leasable area. A total of 40 of the over 200 stores in its new wing have opened. ACC now has a total of 600 outlets. It has also doubled its parking slots to 1,600. AyalaLand Inc. (ALI) president and chief executive officer Antonino T. Aquino said the mall expansion is a testament of the company’s long-term commitment of constantly developing the projects they built in Cebu. Aquino said the opening of the new wing will help speed up the rehabilitation efforts of the province from recent calamities. He said that after a series of relief efforts, it is important to shift to the next phase, which is rehabilitation. Aquino said one of the best ways to expedite rehabilitation is through pouring in massive investments in affected locations. “Opening the ACC expansion is our way of helping Cebu and the region speed up recovery and rehabilitation,” he said. Rustan’s Fresh and Rustan’s Department Store are the new wing’s anchor tenants. 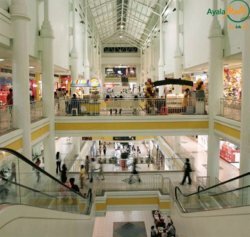 The mall also brings in a mix of premium foreign brands like Zara, Gap, Mango, Toys R Us, and Muji. It will also house a home and kids selections, dining outlets at the top level, a cinema that will have an extended showing time and a chapel. Rowena Tomeldan, vice president and operations and support services head of ALI’s commercial business group, said the mall houses over 40 outlets that are new in Cebu. The new wing also has tenants that are homegrown brands. Most of the stores will open in the first quarter of 2014, but Tomeldan said 30 more stores will be opening before the year ends. The cinema will open in the first quarter in 2014, while the chapel will be opened before the start of Simbang Gabi.